According to the National Oceanic and Atmospheric Administration, 2017 has so far been the second warmest year in the recorded history of the planet. That means this year will extend the record of 16 of the last 17 years being the hottest on record. Voracious wildfires raging in the Western U.S. and the recent severe hurricanes are also menacing reminders of the changing climate. Last week, with this as a backdrop, former Senator and former Secretary of State John Kerry kicked off the Kerry Initiative at Yale University with the Yale Climate Conference. Following an introduction by Yale Forestry and Environmental Studies Dean Indy Burke, Secretary Kerry began on Monday by describing climate impacts we’re currently experiencing and referring to YPCCC data to explain that the vast majority of voters support action on climate change and want the U.S. to stay in the Paris Agreement.,  He also stated that last year, for the first time ever, global investments in renewable energy surpassed those in fossil fuels. In a statement that would be reiterated throughout the conference, Kerry said that there was no longer a question of whether the world would transition to clean energy, but whether we can do it fast enough. The first panel on the Future of Energy emphasized the rapid decline in renewable energy costs, as well as the need for investments in clean energy infrastructure and research and development, both areas that the Trump administration has proposed cutting in its budget. Former Energy Secretary Ernest Moniz called this budget proposal into question, challenging the Department of Energy to spend the $40 billion in loan authority on clean energy infrastructure. Heather Zichal, President Obama’s former Climate and Energy Adviser, highlighted progress on cutting carbon pollution, largely as a result of Obama’s Climate Action Plan. Pacific Gas and Electric CEO Tony Earley and Southwestern Gas Company CEO Mark Boling spoke on the importance of regulating carbon pollution and delivering on the Paris Agreement. Jonathan Pershing, the head of the Hewlett Foundation’s Climate Program, laid out necessary steps to electrify the economy and reach deep decarbonization. These various proposals and strategies all have wide support among American voters. 89% of registered voters support funding more research into renewable energy sources, and nearly 70% support setting strict carbon dioxide emission limits on existing coal-fired power plants, even if the cost of electricity to consumers and companies would likely increase. Monday afternoon, Kerry chaired a panel with Hank Paulson, former Treasury Secretary under George W. Bush; Jeff Immelt, outgoing CEO of General Electric; and Anne Finucane, Vice Chairman of Bank of America. The group focused on the role of the private sector in addressing climate change. Paulson discussed risks climate change poses to business and garnered applause when he said, “The most important policy framework is putting a fair price on carbon.” Immelt also suggested that pricing carbon is now an enormously popular approach – a fact that YPCCC’s surveys support, finding that 70% of registered voters support a revenue neutral carbon tax. Highlighting a point from the previous session, Ann Finucane talked about how Bank of America now finances ten times more renewable energy than fossil fuel energy. On Tuesday, California Governor Jerry Brown, Washington Governor Jay Inslee, Paris Mayor Anne Hidalgo, and President of the World Bank Dr. Jim Kim all sat on a panel on State, City and International Efforts. Kerry again kicked off the panel emphasizing the crucial nature of the Paris Agreement. Mayor Hidalgo, who also chairs the C40 Cities Initiative of global mega-cities leading climate action, emphasized the role that subnational actors played in encouraging national governments to negotiate an ambitious agreement in Paris. Given President Trump’s intent to withdraw from the Paris Agreement, states and cities have an even more vital leadership role in the U.S. now. Thankfully, they are stepping up: more than 2,300 organizations and governments representing nearly half the U.S. population have pledged to follow through on the objective of the Paris Agreement. Brown, Kerry, and Inslee also urged Yale students to get involved in elections. They suggested that not only do we need to raise the profile of climate change on politician’s radar, but we must also turn out more voters in general, citing 2016 as a 20-year low in voter turnout for Presidential elections. A session later on Tuesday with remarks from former Secretary of State James Baker and video messages from current Senators Lindsay Graham and John McCain explored bipartisan support for action on climate. Graham called for a price on carbon and announced that he and Senator Sheldon Whitehouse are currently working on a bipartisan carbon tax bill. Baker considered the advantages to putting a price on carbon including: 1) that it does not require supporters to have a particular view of climate science; and 2) that money collected gets returned to the American people, thereby avoiding the stigma of a “tax” that goes into the Treasury. Students and faculty packed Woolsey Hall for the conference’s closing session with actor, philanthropist and climate activist Leonardo DiCaprio. 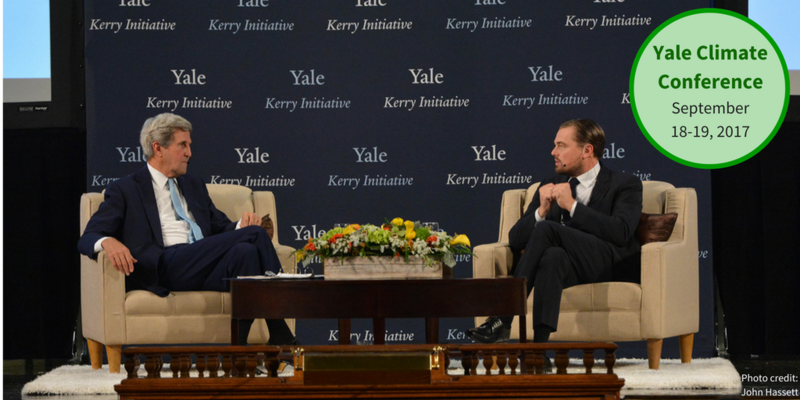 In a colorful dialogue with Kerry, DiCaprio urged three main actions for students and citizens to engage: vote for candidates that support climate action; support businesses that take climate and sustainability seriously; and get involved in organizations that are working on solutions. DiCaprio also announced $20 million in new funding from the Leonardo DiCaprio foundation to over 100 organizations that are at the forefront of the fight against rapidly advancing climate change. At a time when the impacts of climate change and political turmoil are straining the stability of our infrastructure and institutions, the Yale Climate Conference offered a timely call for climate solutions and activism: our efforts to date are necessary, but not an end point. It’s on us to do more.